October 21, 2016 January 2, 2017 / Elizabeth T.
It’s really no secret that Asian skincare is at least 10 – 12 years ahead of Western cosmetics. From BB and CC creams, to sheet masks, to cushion compacts, all of these Asian beauty trends have become global phenomenons in the past few years in a wide variety of countries around the world. What really sets Asia apart from the United States is the dominant conception of skincare as an art form, a practice of investing in yourself every morning and every night. Rather than reacting to skincare problems, such as dry skin and wrinkles, as is commonly done in the United States and other Western countries, Asian skincare focuses on prevention, long before these problems might even occur, which in turn, ensures healthy, beautiful skin. From groundbreaking ingredients to cutting-edge formulas, as well as constant research and development, the heartbeat of skincare and cosmetics advancement sits in Asia. Although countries like Korea, Japan, and Taiwan are the leaders of skincare innovation and the beauty industry, a lot of their products are still inaccessible to those in different parts of the world. Today, I’ve partnered up with 3B Beauty Beyond Borders to introduce you to a new service that will not only make Asian beauty easily accessible, it’ll also help you build a beauty routine that’s worth slowing down for! If you haven’s heard about 3B Beauty Beyond Borders, they are a fast-growing Seattle based e-commerce website that not only focuses on bringing groundbreaking Asian skincare and cosmetics to those in Western countries, but that also offers a monthly subscription service rivaling that of Birchbox and Ipsy. Rather than just highly coveted products, though, 3B Beauty Beyond Borders offers some of Asia’s newest and most innovative gems. This eye serum boasts an incredible list of hero ingredients, such as honey, and hyaluronic acid. Not only they nourish, firm, hydrate, and brighten the eye area, it’s also extremely light, so it can be used in the AM too! A no-fuss, non-heavy cream, this little baby is perfect for the colder months without making skin sticky. It’s definitely great for normal to dry skin types who need an extra boost of moisture in the winter. I’ve been a fan of Skin79’s BB creams for as long as I could remember, and it’s still one of my most used base makeups till this day! I always use the gold edition, but I’ve also heard such great things about the pink one! It’s more of a matte finish, and I think it’ll be great for a night out when you know there’ll be lots of flashing cameras! This softener is formulated to prime, rehydrate, and enhance the effectiveness of moisturizers, providing smooth and firm skin on the inside to deliver moisture to the deeper levels of the skin. If you’re not a fan of moisturizers because of their stickiness or greasiness, then this emulsion is perfect for you. With its lighter, non-sticky formula, this emulsion works with the skin’s natural oils to promote hydration. Packed with anti-wrinkle properties, this emulsion gives skin a firming effect with continuous usage, making it a well-loved product by many, especially those with dehydrated or dry skin. There are a number of solid form cleansers that convert to oil upon massaging lately in Korea, and I’ve heard such great reviews about them! Not only are they more convenient to travel with than oil-based cleansers, the balm is also mess-free and leaves skin feeling hydrated and moist. With a list of natural ingredients, such as shea butter, botanical oils, and coconut extract, this cleanser will work great as a makeup remover. 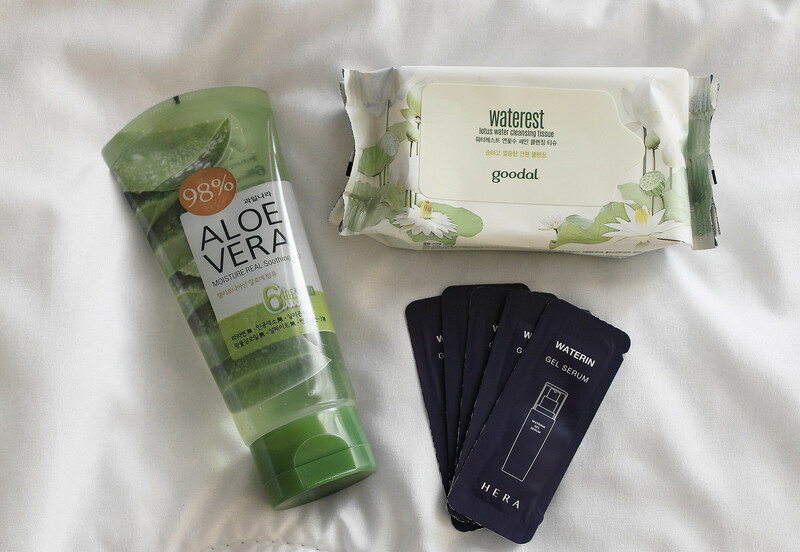 As you’ve probably seen from my posts here and here, you know how much I love aloe vera gels because they’re the perfect soothing skincare product when everything’s going wrong, and the skin is acting up and not working with any other products. What makes this one stand out is that it’s alcohol-free and made of 98% organic aloe vera, cucumber extract, and vitamin E, which will sooth sensitive, irritated skin. While most sheet masks offer ample amounts of moisture, this revolutionary Amazonian Acai Anti-Pollution Mask minimizes the effects of pollution on the skin too! With advanced coconut gel technology, this mask instantly calms irritated skin for smooth supple moisture. I love having makeup wipes in my cabinet as a fail-safe, for those nights when I get home too late but still need to remove my makeup properly. These lotus water cleansing tissues are non-irritating, and I love how effective they are! They’re the perfect way to end a long day, so you can take off all of the dirt, grime, and makeup from your skin, prepping it for cleansing. Pinitol, a stable extract found in the plant carob, helps maintain moisture levels within the plant, ensuring that it’s unaffected by environmental conditions such as cold, stress, and draught. This luxurious serum by Hera is made with pinitol to help skin naturally readdress moisture levels and refreshes skin that has become used to dry weather and hot temperatures. Thank you so much 3B Beauty Beyond Borders for giving me this opportunity to be a part of this revolutionary process of introducing Asia’s most coveted products to those around the world. If you’re also interested in building a life-long skincare routine to help you bring out your most beautiful and healthy skin, please do check out Beauty Beyond Borders to try your first subscription box today! This is so neat! I always wonder what’s new out there for the Asian beauty products or brand, and it’s a bit unbelievable to me that I get a great access to these brands just a stone throw away, which is a bit hard in other countries from your reading above. I guess that’s why I packed a bunch on my way to Europe as well. Thank you so much for stopping by Tiff ❤ 🙂 Long time no talk! Haha and yes, this new subscription box is so wonderful! I've been really loving the aloe vera gel 😀 It works so well and soothes the skin so much! Yep, I really like this one too! 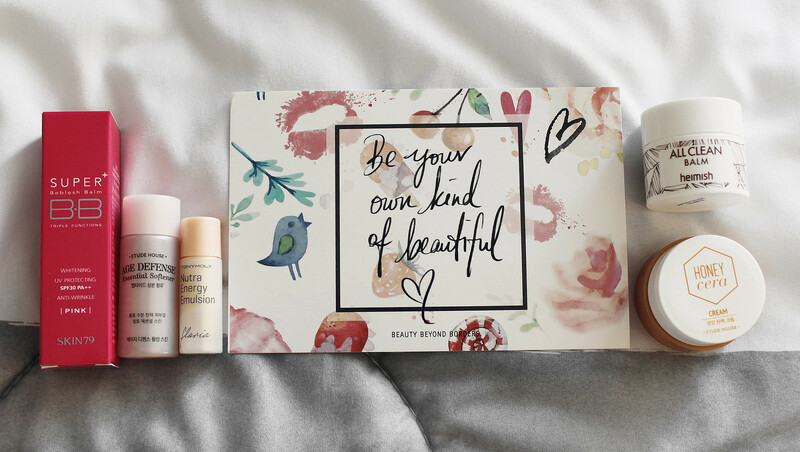 ❤ 😀 I think it may be better than the Birchbox, since the products are more catered towards our type of skin! Thank you so much for stopping by Jenni ❤ 🙂 I love Asian skincare too, and though we have easy access to it in LA, I know it can be hard for those that live in other cities! Hope you enjoyed this post! Such a fabulous post and what a great selection of goodies, sweetie!! I was reading your comparison between Asian and Western skincare and I’ve been nodding along “YES, this is it!” Asian brands know what they are doing! Prevention is the key! Wrinkles won’t go away, unless the person resorts to minor surgery procedures. I honestly wish I could get my hands on more fab Asian brands. Are there any you can recommend, hon? Hahaha yes, Asian brands really take the prevention aspect seriously! I’d definitely recommend trying Laneige – they’re a very great brand that offers quality skincare at a reasonable price 🙂 ❤ Thank you for always being so supportive of my blog as always love! 😀 I've missed you! The variety of products in the box is on point! That really makes me wanna subscribe, haha. Beauty routines in the East are so important to women, and men too, it’s a healthy habit that remains at the center of their lives (maybe a little too much for Korea? haha), I find it especially interesting. What I find even more interesting is how diverse yet similar their approach of beauty is depending on the country. I hope you enjoy this box! I’m a big fan of Asian beauty products! Love this 3B box! Yes, it’s so amazing ❤ 🙂 I love the selection! Definitely adding this to my list of beauty products to try! Thank you so much love ❤ Glad you liked it!